In the dark ages (aka life before blogging), I was still an inveterate bookworm, still a book collector, and I was less afraid of Friends of the Library book sales. What was that I just said?! Yes, I’m afraid of used book sales. It’s a cheap opportunity to add to my TBR (to be read) stack, and therefore too much temptation to handle. But in the days before that TBR pile grew out of control, I loved going to sales. My justification? I’d send my sister boxes of young adult and classic titles for her classroom library. 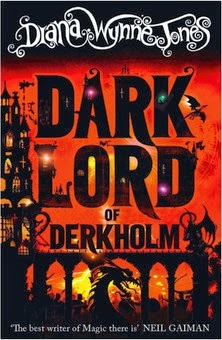 One of the used paperbacks I remember sending was Diana Wynne Jones' The Dark Lord of Derkholm. I didn’t know if it would work. I didn’t know Diana Wynne Jones then like I do now. BUT. When I visited Ginny’s classroom one summer to help set up for the school year, she remarked that The Dark Lord was one of the best-loved books of her collection. I kept that filed away in the back of my mind, and when I saw it (with a pretty cover!) on sale in a book shop on my Irish vacation, I purchased it and read it on the flight home. Everyone—wizards, soldiers, farmers, elves, dragons, kings and queens alike—is fed up with Mr. Chesney's Pilgrim Parties: groups of tourists from the world next door who descend en masse every year to take the Grand Tour. What they expect are all the trappings of a grand fantasy adventure, including the Evil Enchantress, Wizard Guides, the Dark Lord, Winged Minions, and all. And every year different people are chosen to play these parts. But now they've had enough: Mr. Chesney may be backed by a very powerful demon, but the Oracles have spoken. It's up to the Wizard Derk and his son Blade, this year's Dark Lord and Wizard Guide, not to mention Blade's griffin brothers and sisters, to save the world from Mr. Chesney's depredations. I thought this book had a very clever concept: What would happen to a fantasy world exploited by tourism? Of course the immediate thought that comes to any fan is, 'How can I book this vacation?!' But The Dark Lord also tackles side issues of letting children find their place in life and the economics and ethics of fantasy worlds (yes, there are such things!). This is no Disneyland vacation, and people die (and do not regenerate). In that respect, it feels like a more grown-up book than some of Diana Wynne Jones' other works, and it lacks the laugh-out-loud ridiculousness that lightens the mood of Enchanted Glass or Howl's Moving Castle, for instance. It's still her signature, inventive fantasy, with exceptional world-building and the added bonus of a complex, nuanced commentary on imperialism and tourism-forced cultural change. While not as character-driven as some of her other works, The Dark Lord excels at describing Derk and his family: his wife, an extremely talented magic-user herself, and a mix of human and griffin children, animals, neighbors, and work associates (wizards, naturally). It's a good choice for lovers of magical beasts (think dragons, griffins, and so on), and it's the sort of story where the narrative arc may be obvious, but the setting, characters and journey are worth the ride. Recommended for: fans of fantasy (the longer-standing the better, I think), those who enjoyed Garth Nix's Abhorsen series, Robin McKinley's Pegasus, or Harry Potter and the Prisoner of Azkaban, and adventurous adults and children alike (ages ten and up). I love this book so much. The first time I read it, I thought it was okay. But then I couldn't stop thinking about it until I read it again and then that's when I fell in love. It's so original and fun and, well, griffins!